In Ethiopia, tattoos have been a part of the culture for years and are accepted – as long as they are tribe-related. Traditionally, tattoos here are mostly done with a variety of sharp objects (everything from pens to razors or even with a compass) and they use ashes or pen ink for the tattooing itself. 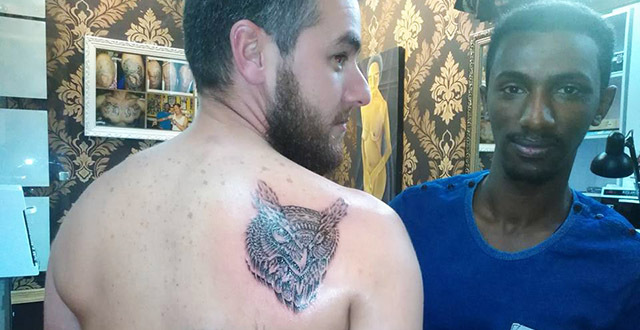 A few years ago, people here looked at you a little differently when you had tattoos as it was an unusual thing to have but these days in Addis you see more and more tattoos among younger people and getting a tattoo in Addis isn’t so unusual. Mostly they are religious tattoos like crosses, rose beads or biblical texts. To feed this surge in popularity, tattoo shops are popping up everywhere and I often get questions on where I got mine. As a girl who had got most of her tattoos in Addis, I will advise you to go to Zola Tattoo in Bole. It’s run by Zola who runs a very professional operation and is a good guy all around. He has experience in the art and can help you out with your design if you like. Three years ago when I first thought of getting a tattoo here in Addis I was a bit scared for the obvious reasons: the level of hygiene, the ink, the skills of the artist, and well how would it heal. When I on accident stumbled upon Zola Tattoo my fears faded away immediately. He had hundreds of pictures of the tattoos he had done, and yes he has the skills. The needle was from a sterile packet, gloves were there, and he had a real tattoo gun. I was impressed and I didn’t hesitate to get my first Addis tattoo right there on the spot. Now three years later, I have seen the Zola grow. He is more famous than ever and his skills and creativity are growing every day. His speaks English well and is happy to help you both with the designs and placing. He takes his time for you and if you need about two hours for the placing he is patient and will make sure you’re 100% happy before getting started. 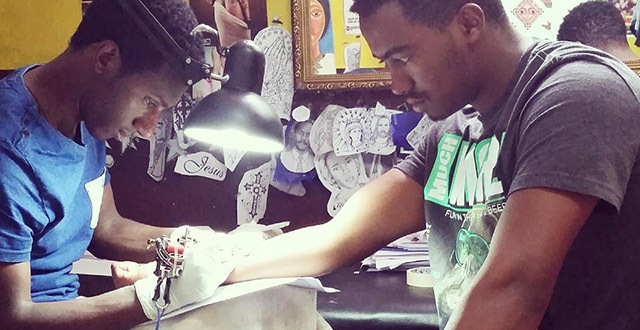 The starting price for a tattoo is 1,000 Birr and the larger and more complicated the tattoo, the higher the price. He starts working from 10am and closes at around 8pm if there is no appointment. If you made an appointment he will stay with you until the tattoo is finished, even if it is midnight. If anyone is thinking about getting a tattoo in Addis Ababa, this is really the place to go! After years of wandering around Eastern Africa she is for now permanently here in Addis Ababa running a restaurant and cafe in Bole Atlas called Via Via. Though she is a bit young she is working hard to realise her dreams that once seemed far away.